Nightly Business Patrols - Security Pros, Inc.
We cover all of Bend and Redmond with 30 hours of nightly coverage, 365 nights per year! 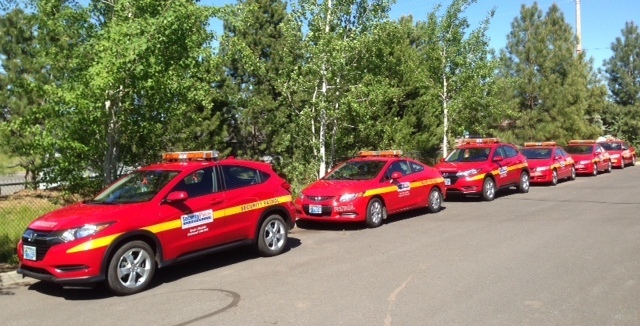 Our nightly business patrol routes will have your commercial property covered in Bend and Redmond, between 6:00PM and 6:00AM, for 30 hours of combined coverage per night, seven nights per week, 365 days per year. No other security company offers this amount of comprehensive, non-stop patrol check protection with a fleet of the most visible vehicles! We check that your buildings doors and windows are secured, that no one is loitering on your property, and we provide professionally produced security signage to enhance this effort. If we discover any problems, the police will be promptly notified and we will stay to assist until they release us. You will receive detailed reports on all of our findings, and will only be called if a serious situation is discovered. While others may claim to have stopped at your location during the night … we can prove it! Security Pros utilizes an Electronic Verification System (EVS) created by Track-Tik Guard Tour Management System software. This consists of NFC Tags mounted by all of your doors and checkpoints, a smart phone that records the EXACT date and time each checkpoint was touched, and customized computer software that organizes this data into specific weekly reports for each of our clients. This system is tamper-proof, it cannot be altered or manipulated, and provides you with absolute PROOF of our nightly efforts to protect your property. We offer the security industry’s leading electronic verification system to all of our clients at no additional cost because our reputation relies on honesty, reliability, and professionalism. You deserve no less than this from your trusted security partner….Demand it by saying “NO” to the “DRIVE-BY” passive security offered by the rest. You can trust the region’s largest security provider to create a customized patrol check program for your business. Call (541) 330-0404 or use our contact form for a free consultation and needs analysis. Let us know what you need. We'll get back to you promptly.